One of the greatest ongoing divides to reach digital nirvana is the understanding of the value and financial return that attribution plays in a multi-touch point customer journey world. This is among one of the top marketing transformational challenges CMO’s face to understand and capitalize on the omni-channel customer journey, among the need to grow digital maturity built upon an integrated marketing technology stack that bridges marketing, sales and IT together to drive strategy and operations. Thanks to the ‘big data’ evolution, the marketing department is in a front-and-center role to drive a data-driven approach into reaching exceptional customer outcomes, and within everything they do to deliver a truly customized omni-channel experience across all touch points in the customer journey. Starting with marketing technology stacks that are fully accessible and integrated, and marketing technologists to drive them, is a deciding factor if an organization can leverage the wealth of data scattered throughout the organization to achieve deep customer insights across the business. Marketing Technology Stack: Web Analytics, Marketing & Email Automation, BI data warehouse, Content Management System, CRM system, Lead Scoring Apps, Social Media Management, Predictive Lead Scoring and Modeling Apps, SEO Management Platforms, Demand-side Platforms (DSP), etc. (not inclusive). I admit it is easier said than done, but marketing (and IT) must orchestrate the technology around the customer, and proactively synthesize the technology into strategy and operations to really achieve brilliant marketing, which is about attaining a customized customer experience across the multiple touch-points in the buyers-journey. This might look like a customized (not personalized) experience from a data-driven customer segment campaign to influence conversions or increase CLV, or a customized experience on the website to influence the buyer-journey stages, or valuing in-between touch points that assist pipeline lead quality. Because sadly the customer-journey is not as linear as previously understood (actually its quite asymetrical), which creates a flood of questions around what and how to value the omni-channel journey, especially in the B2B world. Various studies have confirmed a shift in the buyer journey where a typical B2B prospect is 57 % of the way through the buyers journey before contacting a sales person. Even Forrester Research found that the potential customer has completed as much as 90% of the buyers journey before reaching out to a sales person. Just take buying a car as an example and how much of the buying process has changed over the last 10 years. Bridging and empowering marketers with the above, needs to drive strategy that is embedded across all operations with sales and CSRs. But I’ll leave the details of the marketing technology stacks and trifecta relationship between marketing, sales and IT (technology) to another post, and get to the root where a black hole exists today among marketers in the customer journey; understanding, measuring and valuing the attribution channels and multiple touch-points in a prospects buyer-journey. Traditionally sales and marketing have an understanding there is an attribution effect between when a prospect is first found (ex. trade show or cold call), and the closing of the sale. These first and last touch events, channels or touch points have become the measurement stick in how valued certain marketing channels are viewed, and where strategy investment is applied. Every touch point in-between that provided a degree of influence or attribution in the journey towards closing the sale is traditionally neither understood, let alone measured. IMHO this results in marketers throwing budgets blindly at channel strategies (or combinations thereof), without a means to measure beyond the last touch conversion or sale. Look no further than the investments marketers make in social media strategy to support acquisition programs. Sure there is some value – but at what cost versus not just other channel as Search, Display or Email, but more importantly the combination of these channels, and how they all play together within the buyers journey. At the end of the day, a marketer should seek to understand what path(s) to conversion are most profitable and valued….and why. The lack of strategic priorities for an organization, or marketing altogether, to gain visibility or insight into the channels or touch points that assist towards a conversion or sale is surprising….especially knowing that somewhere between 60%-90% of the buyers journey is now done before the prospect even reaches out to a sales rep. The massive shift in the buyers-journey thanks to the web and ‘big data’ needs prioritization within marketing. How else will you know where to best invest marketing dollars to gain the highest ROI, or best quality leads to fill the pipeline or how to find more of your top 2% whale customers ? There are solutions and tools within the marketing technology stack to give insight into the performance of multi-channel attribution (mostly from a first-touch and last-touch view), and some solutions to the extent of providing ROI or even lift. But when you catch a glimpse of how other marketing channels play together and influence conversion paths, or how attribution plays a role in your digital strategy performance, then like most data-driven marketers you’ll want to place a microscope on how they’re valued, and the financial or lift value it delivers against leads and sales. Why is this important? Most organizations and startups today evaluate digital marketing performance and conversion KPI’s from a last-touch or first-touch view. There is zero value applied to all the touch-points in the customer journey that assisted or helped influence the user to convert on the goal(s), irrespective of which channel provided the most influence. I find it surprising that businesses struggle with valuing attribution or assist channels today, but yet its at the front-and-center priority to anyone who follows team sports. If a business viewed marketing investments in the same manner that a professional sports team views player investments (players = marketing channels / sources), then a business would be in a better data-driven decision making position to know where, how and the optimum combination of channels to invest to score customers or leads…..or the one or two channels that play the strongest influence role in the customer journey. For example, lets look how Manchester United invests in their players. Are the highest paid players (marketing channel investments) given to those who provided the most value and overall performance? Goals scored in a football game rarely ever follow the same first and last-touch path every time. But if you took an evaluation over the last 100 or 1000 paths towards each goal (or sale), and you’ll see patterns arise. Similar to leads and customers coming through your front door, or converting online, rarely is the same combination of cross-channel paths taken each and every time…although patterns will become very apparent. A combination and mix of each marketing channel plays a part to get found by a lead, influence the lead and convert the lead to a customer, and even cross-pollinate the customer with to influence them on up-sell and cross-sell opportunities. The question is understanding which “combination” of channels or touch points provides the highest-quality of leads, lowest friction points to acquire, and the most profitable customers. Let’s run an example: Keep in mind, the ball is the prospect. Does defender Rafael Pereira da Silva (lets’ call him the Social Media channel ex. LinkedIn) take the ball (the prospect), and passes it up (first touch) to midfielder Shinji Kagawa (channel = Paid Media or Display). Shinji then passes the ball up (second touch) to forward Rob van Persie (channel = Search Organic), then abandons the anticipated ‘forward’ path of momentum to conversion (the sale), and instead passes it back (third-touch) to midfielder Marouane Fellanini (channel = personalized re-targeted Display), and now passes the ball forward again (fourth touch) up to striker Wayne Rooney (channel = Search Organic or Direct), who is the last-touch channel to score the goal (conversion of prospect to a MQL lead (marketing qualified lead). Evaluate over time each and every path the ball took up the field, or your paths to conversion, before the goal was scored. Trends will arise and you’ll see if the ball (prospect) touched Marouane Fellanini (channel = Display) +50% of the time, then you can begin to understand the weighted value this channel plays in your marketing, versus others. Just imagine if you understood this journey of your top 2% whale customers, you’d better understand their behaviors, where more can be found and how best to influence them. Perhaps Rooney (channel = Organic or Direct) scores 80% of the time when Marouane (channel = Display) is involved in the play, and scores only 20% when Marouane is swapped for another player, or neglected all together. This is why measuring the value of your last touch is just as important as measuring the assists and influencer values. I’ll demonstrate this influencer value below to help show how this can be calculated. Note: I’ve retained a simplified scoring approach to attribution, but there are other ways to score and measure attribution and assist value. All 5 goals were assisted from other players. Without any other player (or multichannel) influence, we’ll assume he would have scored 0 goals for this demonstration. From this example, the strongest influencer value of 5 came from the Yellow Player and White Player, and a total value awarded to the White Player (not Blue Player) for its total score of 6. Again – this is a simple demonstration how influencer value, and total value, can be determined, with a much deeper understanding around the influencer touch-points for your top-tier clients, and those that also influence churn reduction. This understanding of the value awarded to assist channels must play a significant role in dictating where budget or investments should be made to influence the user journey. Once you get there to identify those channels, then begs the question is how much value do you place on each one? Some organizations simply apply an even split value for each assist channel. It’s a fair start, but then so would be paying each player the same salary regardless of who provides the greatest influence on winning the game. But keep it simple to begin. My intent is to start you down the path of consideration to help you get there, and begin determining what tools are available to help. And once a few solutions or tools are discovered, then the challenge begins on demonstrating to budget owners how the solution will provide its measurable return; such as the efficiencies it can deliver and the return on the investment. (feel free to steal my football analogy in your deck). There is much economic gain from this once you scrape the surface. In my experience with a global entertainment brand, the digital strategy I led against a marketing automation strategic unveiled how just one (or many) touch points in the marketing strategy was not only influencing 30% of conversions, but was driving over 50% of revenues. It was not a first or last touch channel, but a significant channel that played a major role in the path to sales conversion. Letting data sell itself, the one channel functioned as both a major influencer for both conversion and retention objectives. You could just imagine how much top-brass support I received after showing the revenue and CLV impact. Now beyond the economic gains to be had with an attribution solution applied to your digital mix, the intangible gains can be viewed similar to the advantages attained from your web metrics solution, such as Google Analytics, Omniture or other enterprise web analytics. For example, what wins and efficiencies have been gained from deeper insights obtained from your data warehouse, or CRM analysis, or web analytics to gain greater confidence around data-driven decisions and practices? And is all the data produced from each lead and customer amalgamated into a central data-warehouse to get the full 360 degree view on how your leads and customers are behaving across inside and outside your business? But as a start, you’ll find the low hanging fruit with the enhanced accuracy gained in marketing investments from filling in the gaps of your first-touch and last-touch measurement methodologies, lead gen. scoring and leads online behavioral foot print, and/or the confidence gained on channel path performance. How you justify the need to your boss is best left to your personal approach, but the leverage you can gain from presenting the data instead of taking a gut decision can be best left to providing an understanding of its investment return in your pitch, so consider these points to understanding the value of the attribution channels in your customers journey. A) Ad Spend (AS). What is your ad spend for the marketing channels on which multi-attribution modeling will be included? B) Conversion Volume (CV). What is the volume or quantity of conversions you attributed to those channels? A bit of estimating on the conservative side may be required. C) Sales Value (SV). What is the total sales figures you assign to those channels. B) Next, calculate the average gross margin of a conversion (AGM). Ex. (GMS)/CV . But you may have your own methods for calculating the value of your conversions, so you can use that too. You have an ad spend of $1M (AS) that generates 100K in conversions (CV). This produced $5M in total sales (SV) with a gross margin (GM) of 30% (GM). This would produce a gain on marketing spend (GMS) of $500K, and an average gross margin per conversion $5. This aims to provide a more clear picture of the marketing climate with no attribution applied. But now lets look at the value after you launch an attribution solution. There is no crystal ball to tell you the true value of an attribution solution after its been implemented, but you can provide a somewhat sound estimate of the potential gains in conversions attained from leveraging the benefits of attributionâ€¦and all while keeping your media spend the same. The same could be said for the ongoing optimization your team applies to Paid Search, and the efficiencies and gains you achieve. Did the spend increase? If the answer is no, then you either reduced it and/or reinvested it to continually optimize the channels efficiencies. The same could be said or Display Ads, and optimizing prospecting campaigns through a re-targeting model….or the conversion optimization you digital marketers employ to test, learn and optimize your conversion funnel. There is only efficiencies to be gained to drive down the cost and investments into each activity – and in the case of attribution modeling – driving (and exploiting) the costs you invest into each marketing channel. So how would your return look if you invested into an attribution solution after its implemented? Scenario: Based on the above scenario, let’s say you introduced attribution into your KPI’s and you saw conversions lift of 10% (assuming media spend is equal). The lift value from this on average would run 10% to 35%, assuming no performance differences by organization or industry (which is likely not the case). If you want to get a more accurate picture, you can test media spend exclusively in channels that impact your sign ups and conversions, and use the performance gains as a gauge for this metrics. In the example above, the number of conversions (CV) was 100,000, meaning post-implementation it will be 110,000 (CV * 10%) at the same $1M media cost (AS). Add the same historical average conversion value of your AGM, and these 100,000 conversions will go on to produce a significant gain on marketing spend after the implementation of attribution (GMS*). Noting too, the gains you make will, or should, increase over time as your digital strategy and programs grow. Albeit, be sure to factor in the total cost of your attribution solution in your calculations. Now aside from all the ROI number crunching, remember an important caveat to winning over the boss to invest into an attribution solution. The biggest barriers to investing into an attribution model solution is the political will and the organisational buy-in to make the necessary changes necessary to benefit from the opportunity. It’s important to engage with someone who is knowledgeable on the holistic view of digital marketing and attributions role in winning new customers. And if you do manage to win over the boss with an investment into attribution modeling and tracking, you’ll soon have a solid perspective and possibly unique position to influence data-driven marketing decisions. 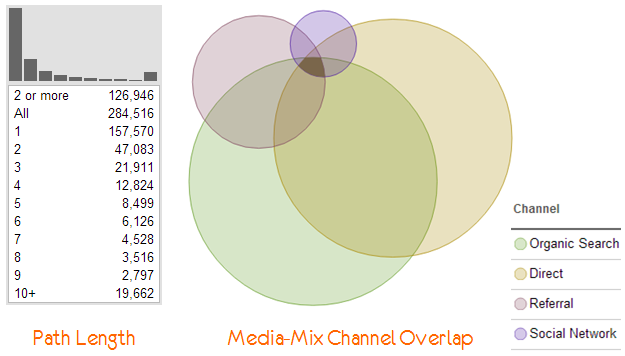 Do you use attribution modeling in your mix? Just starting or if you’re an guru, share your questions and insights and comment below..